Happy new year! I hope you all enjoyed Christmas. I went home to Mayo for the first part of Christmas, where I had a great few days meeting up with friends and family and eating lots of beautiful food! I love being at home in Foxford for Christmas! On the 29th of December, Colin and I, along with my cousin and his girlfriend went to Pairs for a few days. We stayed in a hotel in the Latin Quarter of Paris, which is very central to everything worth seeing. I first went to Paris in 2006 when working as cabin crew with Emirates. It's really one of those places that never fails to impress, and each time I return I grow more and more in love with the place. On previous visits we did a bike tour of Paris with a company called Bike About Tours which I would highly recommend. The guys who run the company are really cool, the tour is very informative but not over the top with boring facts and is a great way to blow off the cobwebs from the night before! Much to our disappointment the bike tour was closed for Christmas. Instead we decided to brave it and just hire the city bikes. It was great fun cycling around Paris and jumping in and out of shops, restaurant and galleries! We were lucky to have some great recommendations for places to eat and drink from friends that lived in Paris. As with all our trips we could have done with a few extra days (and euros!) for shopping and eating. In saying that we didn't hold back as we were celebrating our anniversary, treating ourselves to some fab meals in Le Comptoir, Cafe Louis Philippe, Chez Janou and Cafe Divan as well as coffees in the famous Cafe de Flore - which is such a great place for people watching! We also went to a few cool bars in the Latin Quarter and in Bastille, where we rang in the new year in a really funky jazz place called LesDisquaires. Much to my horror, we realised late on new years eve that the shops were closed on January 1st, which put a sudden end to our shopping! But I still managed to get a leather skirt and a hat in a vintage shop in Le Marais, and off course a few pieces in Zara! In hindsight, it worked out for the best as we had more time to experience more of the cultural gems of Paris, spending a few hours in the Musee d'Orsay. The building itself is a work of art. If you like art, then you will gasp in wonder at the sheer range of masterpieces that are on display there, from Monet, Manet, Van Gogh, Cezanne, Pissarro... the list goes on and on. 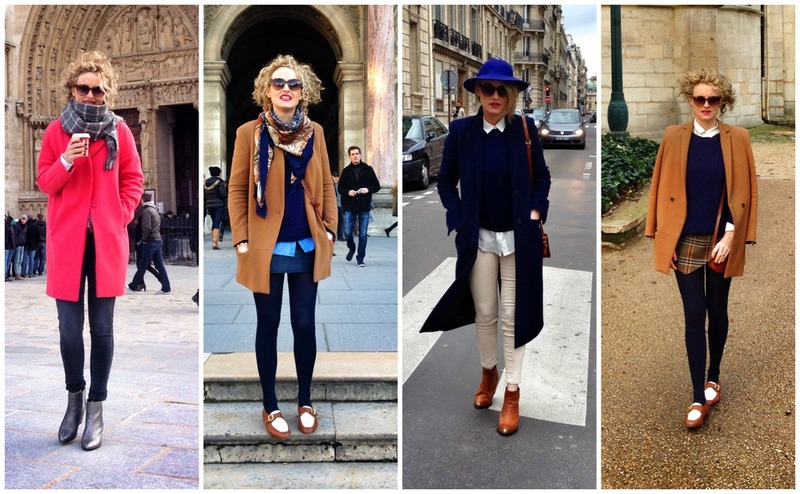 Above are images of the outfits that I wore on each of the days in Paris. I have also included a few of my favourite pictures below from the trip.